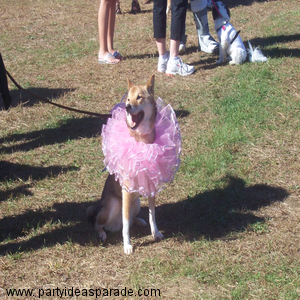 We found this cute doggie ballerina costume idea at a howl and walk fund raiser. There were so many dogs dressed up in cute costumes. Some owners dressed up in outfits that matched their pets...it was a great day and it was for a doggie charity so it was double the fun. Find more Cute dog costumes like this ballerina. There are plenty of others too, like the sailor or the convict...there's even a bee and a ladybug costume for dogs. Do you have any pictures of your dog in a costume? Share it with us...have the fun of putting your dogs picture up on a web page. Join in and write your own page! It's easy to do. How? Simply click here to return to Halloween Costumes For Dogs.